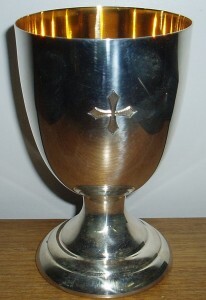 Silver chalice with gold plating inside the cup. At an economical price, this chalice is very suitable for services in which communion is distributed to the congregation under the forms of both bread and wine. Made by artisans in Melbourne, this chalice (in a goblet style) is 13 cm tall with a cup diameter of 83 mm.